Who doesn’t love a good wooded, country setting for a home? The trees provide shade, clean air, and this time of year, beautiful fall foliage. But, as much as we love them, trees can also wreak havoc on our homes – particularly the roof. Since we live in Indiana, trees are pretty commonplace and don’t usually cause a lot of concern or alarm for the typical homeowner. However, the problem is that trees can damage your roof in ways you don’t necessarily expect if you’re not paying attention (key words: pay attention). We’ve all seen TV footage after a storm of buildings or homes with the roof caved in by toppled trees. While this, of course, is possible, the much more likely scenario for roof damage caused by trees is much less dramatic but could be just as costly. Here’s what you need to know about how trees can damage your roof. What goes up must come down, and branches are no exception. If it’s there it will eventually come down, whether you have control over how and where, or not. Keep branches pruned away from the house so they don’t break during a storm and do some serious damage. The most common type of shingles in Indiana are made from asphalt. They are covered with little rock-like granules that add durability and protection from the elements. Over time, these little granules wear off and are washed away. While some loss of granules is normal, overhead tree branches can expedite this process. When the wind blows, if branches are too close to the roof, they could rub against the shingles and scratch off the asphalt granules. Without the protection of the granules, that area becomes prone to moisture, rot, and leaks. Tree are like a highway for squirrels and other critters, and the branches over your house are a one-way ticket to a cozy warm nesting space. Prune trees away from your roof and keep your roof and exterior trim in pristine condition to discourage pests from taking up residency in your attic. In the heat of the summer, having a lot of shade trees around the home is nice. However, branches that shade your roof will prevent moisture from evaporating quickly. This allows the moisture to soak into your roof, which over time, can cause rot and decay. This ultimately leads to leaks and higher energy bills as air escapes. In the same way that shade from the trees can allow moisture to accumulate, leaves and pine needles can do the same. It’s important to clean leaves and pine needles off your roof periodically – definitely before it starts snowing. The problem is that when leaves and needles pile up, they trap moisture under them. This moisture can seep into the shingles, and eventually into the wood under the roof, causing leaks and rotting. The point of gutters is to take water from the roof and send it as far away from the house as possible. 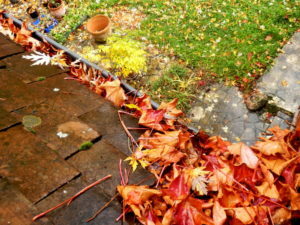 But gutters clogged with leaves or needles will eventually overflow with rainwater, sending it down the side of the house where it could leak down into the foundation or rot away the siding. We know it’s no one’s idea of fun, but while you’re up there cleaning off the roof, you may as well just clean out the gutters too. Whether you’re sure your roof has sustained damage, or you just want the peace of mind that your roof is in good health, call E3 Roofing & Remodeling today. We can help repair any existing damage and offer our insight on any maintenance to prevent future roofing issues. We even offer a free roof inspection! Don’t wait until your roof is leaking! Take action now to extend the health and life of your roof.